The corporate headquarters of BlueCross BlueShield of Tennessee in Chattanooga is one of the largest employers in the region with more than 5,000 employees. Source: Forbes magazine based upon research from Statista from surveys of 50,000 Americans working for businesses with at least 1,000 employees. 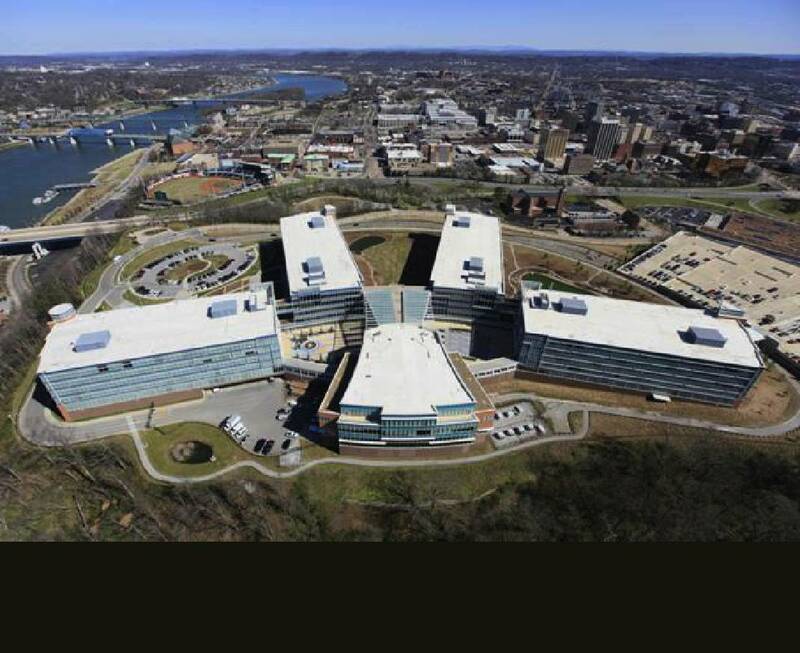 Tennessee's biggest health insurer is among the best employers in the country for diversity, according to a new study of major employers by Forbes magazine. BlueCross BlueShield of Tennessee, which ranked last year as the 33rd best business in the country for diversity in Forbes' inaugural ranking of employers, jumped to No. 3 in the 2019 national listing of the 500 best employers in the country. In Forbes' new list, three other local companies also were identified from surveys of employees as being among the best for promoting diversity. Two Dalton floorcovering firms — Engineered Flooring and Shaw Industries — ranked No. 413 and No. 418 on the list, respectively, while the Chattanooga trucking firm of Covenant Transportation ranked No. 463. The results are based upon employee surveys of more than 50,000 workers across the country. The Chattanooga- based BlueCross ranked highest among all health care and insurance companies in the country for diversity, which company senior vice president Ron Harris said reflects the company's ongoing efforts to be as inclusive as possible in seeking, hiring, promoting and training workers from as diverse a pool as possible. "We started a much more active diversity effort more than 20 years ago when our CEO at the time, Tom Kinser, made it a real priority and made sure we entered this era that was being ushered in known as diversity," said Ron Harris, who was hired two decades ago to head the initiative at BlueCross. "It was not just a flavor of the month for us, but it has been a long-term strategy to try to be inclusive and promote cultural competency. We talk about diversity and inclusion a lot here, and not just for race and gender but also for LGBT sexual preferences, for the disabled and for veterans to make sure we do what we can to look like the customers we serve." In 2017, more than 20 percent of BlueCross' statewide staff of 6,000 employees are people of color and more than 70 percent are female workers, including more than 59 percent of managers who are female. Harris said with the tight labor market and more demand for workers, "it's a great time for employers to build their teams with creative, driven and efficient staff" and he encourages "fishing in as many ponds as possible" to land the right people. Beyond diversity in demographics, human resources officials at the top firms said they also are trying to build corporate cultures that ensure more diverse voices are heard in the planning for products, policies and programs. Mike Fromm, chief human resource officer at Shaw Industries, said the Forbes ranking suggests that the carpet company and its 22,000 employees are headed in the right direction. "We strive to foster an environment where diverse perspectives and ideas are heard, and value is placed on both seen and unseen characteristics and experiences that our associates bring to the organization," Fromm said. "Diversity and inclusion are necessary for innovation and growth, allow us to better understand our customers and their needs, and position us to attract and retain the best talent."